Sea piracy has been hot news almost as much as soccer or Eurovision recently, and many are surprised that it still exists. But why isn't anyone surprised that the 21st century still has common criminals and muggers? In fact, piracy is nothing but a high-seas equivalent of street crime. Piracy has had its ups and downs (thanks to maritime powers), but has never disappeared altogether. The 21st century has produced both revolutionary technologies and global problems, and one of them is piracy, or rather its rapid growth on a large scale. Piracy is now as much of a threat to the world community as it was in the days of frigates and galleons. The Caribbean Sea has always been pirate-infested. It is mainly dangerous for yachts and recreational craft, but also for larger shipping. For centuries piracy has been rife off Indonesia, in the Malacca Strait and in the South China Sea. But now none of them can compare to Somalia. Even Nigeria, which once was the most piratical of African countries, has faded against the background of Somali's records. Technically, the methods used are the same as described in novels. A fast craft - a launch or a small vessel - comes along a merchant or a fishing ship and boards it. If the ship is small or shallow-drafted, like a tanker, one can simply jump aboard it. If the ship is large, the pirates use ropes with hooks or anchors. To prevent the crew from hosing the pirates down with water and to intimidate them, the pirates fire at the vessel using assault rifles and grenade launchers. An attack takes an average of 10 to 20 minutes. During this time the pirates either seize the vessel, or abandon the attempt. As soon as the pirates climb aboard the deck, the ship is practically in their hands: a civilian seaman will not be able to resist an armed attacker. Somalia has been without government for 20 years now, and is ideally situated geographically, along one of the busiest traffic routes in the world, the Gulf of Aden. In addition, Somalia is the only place in the world where hijacked ships (including supertankers) can be kept until a ransom is paid for their crews. Up to 20,000 vessels sail through the Gulf every year, or 250 per day. Since the beginning of this year, pirates have hijacked over 30 merchant ships. Currently, Somalia has four to five gangs totaling a thousand members, but their strength is growing swiftly. The average ransom in the past four months has been $1.5 million to $1.7 million, but just several months ago it did not surpass a million. This year the pirate business has brought the country $40 million in cash. For the impoverished Somalia, where $10 is a fortune, these millions seem fantastic. 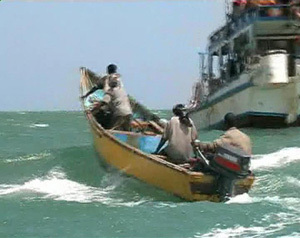 The main pirate base is the town of Eyl on the Horn of Africa. Life there is booming, streets crowded with luxury cars and widespread construction of high-end cottages. A Somali youth who has chosen the "right" profession of a pirate stalks the streets of Eyl confidently, his pockets stuffed with dollars and his mouth full of Khat leaves, a local narcotic plant. In the daytime children go to school, and in the evening they either play soccer or at pirates, something unseen in the rest of Somalia plunged in chaos and anarchy. Piratical jackpot - what is it? Many have hastened to christen the hijacked supertanker Sirius Star a jackpot, but that is wrong. The pirates have not yet hit a jackpot but are trying to. A piratical jackpot is container ships. Imagine an ocean-going ship with 5,000 to 6,000 or even 12,000 containers aboard, filled with consumer goods produced in Asia. From New Year fireworks and laundry detergents to high-ticket luxury items intended for the best boutiques in European capitals. Cargo on board such a vessel is worth hundreds of millions of dollars, and if it is a mega-ship with 10,000 or more containers aboard, well over a billion. It is not oil which cannot be offloaded or sold in Somalia. These are goods that can be pilfered and shipped to countries that have some infrastructure and sold there on the black market. Fortunately, container ships, especially ocean-going, are most difficult to hijack because of their enormous size and high speed, the highest among commercial shipping: 40 kilometers per hour. But the seizure of the Sirius Star has shown that anything is possible. The first method is the most prevalent today. Ships patrol a section of the Gulf but do not open fire on pirates until they attack passing commercial vessels. As practice shows, they usually fire warning shots and very seldom open hit-and-kill fire. Such patrols have saved more than one ship, but they are unlikely to uproot piracy, because attacks will continue all the same. The second method is more determined. Ships and helicopters open fire to kill, regardless of whether pirates attack a vessel or are cruising in expectation of prey. But the recent sinking of a pirates' mother ship by an Indian frigate can be fraught with unpleasant experiences for seamen in captivity and crews of shipping still to be hijacked. The third way is to land on shore and kill or take prisoner as many pirates as possible. But this method is also the most dangerous for the side which launches such struggle. Civilians will be killed, while the military will be charged with brutality and crimes against humankind. There is a fourth option - to use local Islamists as a cat's-paw. But the country is on the brink of being taken over by extremists, or the Islamic radical party Al Shabab. This party is notorious for a sentence passed by its judges, according to which a 13-year-old girl raped by three men was stoned to death. The judges decided that she had provoked the faithful by carelessly displaying herself in broad daylight. 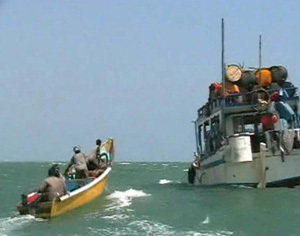 The Al Shabab spokesman, a certain Sheikh Al Mansoor, said on November 15 that the pirates were no pirates, but fighters against unlawful fishing off Somalia. According to him, the warships that arrived at the Gulf of Aden came there because the countries that sent them wanted to colonize their land. Currently, Al Shabab militants are shaking down the town of Haradere in search of the infidels who hijacked the supertanker Sirius Star from their brethren in faith (the tanker has owners from Saudi Arabia). Yet it is obvious that military operations in the Gulf cannot be stopped; they must make the Gulf safe for shipping, whatever happens to Somalia. The fight against pirates has become an anti-guerilla operation on high seas, like the fight against militants in Afghanistan or Iraq. Here it is, the 21st century threat at sea. Not epic battles between navies but a maddening and almost unproductive attempt to swat a gnat with a sledgehammer. 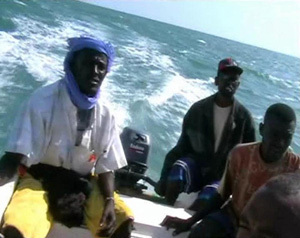 Somali pirates are uneducated farmers or fishermen. Their arms are simple and primitive: assault rifles, grenade launchers, unsophisticated communications and navigation devices. But what if they are joined by hardened criminals, commandos with combat experience, or whiz kids clever with computers and ways of monitoring target ships? It is almost a certainty that criminal communities all over the world are now closely following the experience of Somali pirates and figuring out how to get in on the act. Global shipping carries 90% of all freight and cargo in the world. There is no other activity as international and globalized. Look at a container ship speeding to Europe - its owner is from Taiwan, its flag is that of Singapore and it is run by a mixed British-Filipino-Indonesian-Taiwanese crew. In its holds and on deck are thousands of containers. Several hundred of them are bound for Russia. That is modern shipping. When your life and work are concerned with it, you begin to see the world as a unified whole, and its borders become blurred. In a 21st century world, with its progress and advanced technology, no state can exist by itself and be guided by its own personal interests. It is necessary to agree and to develop new ways of responding to risks and dangers of the present and the future. Today's and tomorrow's piracy can be overwhelmed only through the combined efforts of all serious and sensible countries.